If you are under 13 years of age, do not send any information about yourself to us or on this Site, including your name, address, telephone number or e-mail address. In the event that we learn that we have collected personal information from a child, we will delete that information and otherwise comply with the requirements of the Children's Online Privacy Protection Act and applicable law. If you believe we might have any information from or about a child, contact us at webmaster@ryder.com. You must be at least 13 years of age to register with or use certain portions of this Site. This Site is not intended for children under 13 years of age. We do not knowingly collect personal information from children under 13. We collect several types of information from and about users of this Site, including the information described below. When you provide User Generated Content, as defined below, on this Site's blog(s). We may also collect personally identifiable information about you from sources other than you, such as forums, instant messaging services, blogs, other users of our products and services and our business partners. Collection of Usage Details and IP Address. As you navigate through this Site, we may collect details of your visits to this Site, including, but not limited to, traffic data, location data, logs, the resources you access, and information about your computer and internet connection, including your IP address, operating system and browser type. We may use this information for system administration and to report aggregate information to our business partners. Collection with Cookies. "Cookies" are pieces of information a website sends to your computer while you are viewing a website. We may set and access cookies on your computer to track and store preferential information about you. You consent to our placement of cookies on your computer. Note that most Internet browsers will allow you to stop cookies from being stored on your computer and to delete cookies stored on your computer. If you choose to do so, however, your use of certain aspects of this Site may be restricted. Collection with Web Beacons. "Web beacons" are electronic images, tags or scripts that allow a website to access cookies and help track general usage patterns of visitors to a website. Web beacons can recognize certain types of information, such as cookies, time and date of a page view, and a description of the page where the Web beacon is placed. We may use Web beacons to compile information regarding use of this Site. The information collected through these technical methods, standing alone, cannot be used to determine your identity. Such information may, however, be combined in a way that makes it become personally identifiable information. If this happens, we will treat the combined information as personally identifiable information. To our affiliated companies (i.e. companies under common control or management with us). We may take your personally identifiable information and make it non-personally identifiable, either by combining it with information about other individuals (aggregating your information with information about other individuals), or by removing characteristics (such as your name) that make the information personally identifiable to you (de-personalizing your information). We may use and/or disclose to third parties such aggregate or de-personalized information in any manner and without notice or compensation to you. From time to time, we may participate in or use advertising networks, such as third party advertising servers, advertising agencies, technology vendors and research firms. We may use these third-party advertising networks for marketing, advertising and promotional purposes, as well as to serve advertisements to you. Advertising networks often gather data about consumers who view advertisements to make inferences about a consumer's interests and preferences, which enables their computers to deliver advertisements directly targeted to the consumer's specific interests. This practice is often referred to as "online behavioral advertising." For example, a third-party advertising network might collect the type of Internet browser you use, the type of computer operating system you use, the domain name of a website you visit, whether or not you visit specific pages of this Site and other websites, the location of your Internet service provider's presence, the date and time of a visit to a website and other interactions between you and a website. See the "Online Behavioral Advertising" subsection of Choices About How We Use and Collect Your Information below to read about how you can prevent certain third-party advertising networks from collecting information about you. Email Offers from Us. If you do not wish to receive email offers or newsletters from us, you can opt-out of receiving email information from us (other than emails related to the completion of your registration, correction of user data, change of password and other communications related to your transactions with us or on this Site) by using the unsubscribe process at the bottom of the email. Accessing and Correcting Personal Information. If this Site allows you to create an account with us, then you can review and update your personal information by logging into this Site, visiting your account profile page and making changes. Online Behavioral Advertising. Certain third-party advertising networks that deliver behavioral advertising are members of the Network Advertising Initiative ("NAI"). You can prevent NAI member companies from collecting preference data about you by clicking here and following the NAI's directions. Note that if you opt out through the NAI, you will still receive advertising. In addition, if you opt out through the NAI and later delete your cookies, use a different browser or buy a new computer, you will need to renew your opt-out choice. 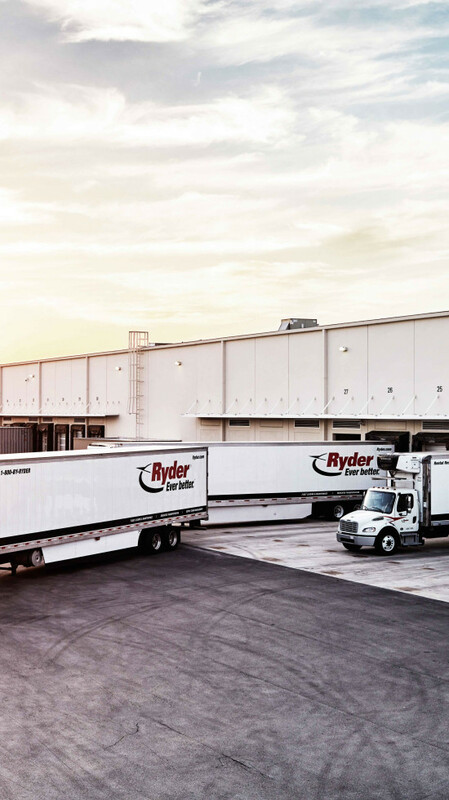 Ryder is committed to providing our employees and customers with the safest and most secure environment for exchanging sensitive and/or private information via email. To ensure privacy and confidentiality, Ryder uses a registered envelope service to protect sensitive emails. Click here for instructions on Opening a Secure Encrypted Email (PDF). This Site is operated in the United States. If you are located in the European Union, Canada or elsewhere outside of the United States, be aware that any information you provide to us will be transferred to the United States. By using this Site or providing us with your information, you consent to this transfer. If you have questions or concerns about our privacy practices or wish to make a request regarding your personally identifiable information, contact us at webmaster@ryder.com. California privacy rights requests must include the reference "Request for California Privacy Information" on the subject line and in the body of the message and must include the e-mail address or mailing address, as applicable, for us to send our response. This request may be made no more than once per calendar year. We reserve the right not to respond to requests submitted other than to the addresses specified in this paragraph.